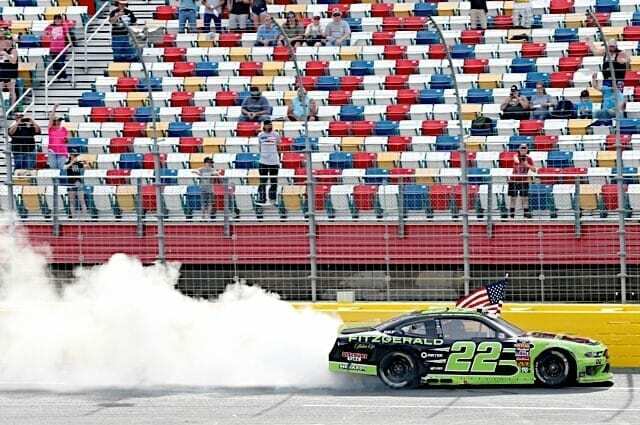 Whenever Brad Keselowski is on the entry list for an XFINITY Series race at Charlotte Motor Speedway, he becomes one of the odds-on favorites to grab the victory. He proved that in qualifying on Saturday morning (May 26) by winning the pole, as well as the Alsco 300. Keselowski jumped out to an early lead but was passed by Kyle Busch midway through the opening stage. The No. 22 car was fifth at the conclusion of Stage 1. The second stage was up and down for Keselowski, as he battled inside the top 10 for much of the stage. But during a caution with less than 10 laps to go in the stage, crew chief Brian Wilson called the No. 22 car to pit road, where he would coast to the finish, saving his tires for the final stage, where he would resume as the leader. During the final stage, Keselowski faded to the back half of the top 10, but on a restart with 39 laps to go, he was able to edge ahead of Daniel Hemric for the race lead, never looking back. The victory was Keselowski’s second of 2018 in the XFINITY Series, also winning at ISM Raceway in early March. Keselowski is the first repeat winner during the last 14 races, dating back to Texas Motor Speedway in the fall. 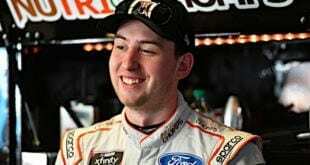 It’s Team Penske’s fourth victory of the season, as Joey Logano was victorious at Auto Club Speedway (March 17) and Ryan Blaney took the checkered flag at Texas (April 7). Cole Custer finished runner-up on Saturday, while Christopher Bell, Ty Dillon and Elliott Sadler rounded out the top five. The composite bodies get an A+ in my book. Sure, they cost upward of $30,000 to put on a racecar, but once they are in tact, they can take a beating. Many drivers hit, bumped and banged into other cars or the wall and continued on in Saturday’s race, and really, that’s how it has been this entire season. Early in the race Ryan Truex smacked the wall, which would typically eliminate him from contention. But the Kaulig Racing crew beat out the right side quarter panels and the No. 11 finished sixth. Much of the same happened with Christopher Bell, who is always running next to the wall. He bounced the No. 20 Toyota off the wall, but it looked as if that damage helped him, as he was closing in on Keselowski for the lead late in the race. Hell, Matt Tifft damn near tore his radiator out of the car getting bunched up on a restart, but had enough speed to finish ninth. Other driers such as Tyler Reddick and Ryan Reed weren’t as lucky after hitting the wall, though both drivers continued on and finished the race, despite not running all 204 laps (both were laps down). Overall, the composite body gets two thumbs up because it allows for drivers to be more aggressive and get everything out of their respective racecar. It’s crucial for NASCAR to continue going in this direction. 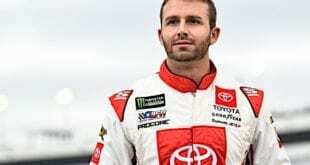 Outside of Ross Chastain, JD Motorsports has struggled to get going through the first 10 races of the season, and the same could be said for Saturday’s race at Charlotte. On lap 78, Garrett Smithley spun, losing a lap. Meanwhile, throughout the race, the second-year driver managed to drive the No. 0 car back to a 14th-place finish. On the other hand, Vinnie Miller, had himself a day. On lap 108, the No. 01 car went for a spin, nearly collecting JDM teammate Joe Nemechek, though escaping on the outside. Getting involved in incidents has been the theme of Miller’s first three months as a full-time driver. 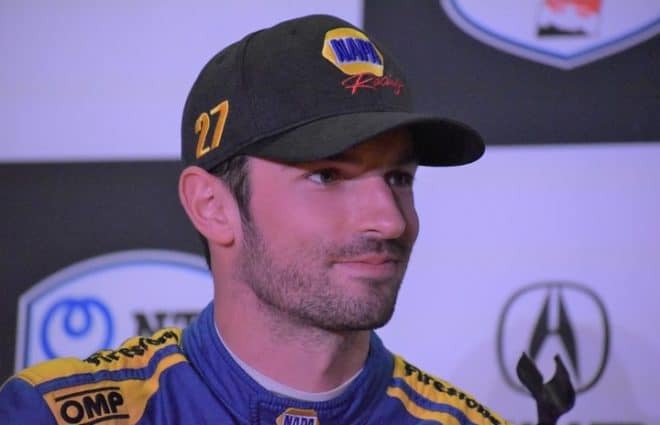 Despite having just two DNFs, he’s failed to crack the top 20 in nine of the 11 races this season, and even spun on his first lap of practice on Thursday at Charlotte. 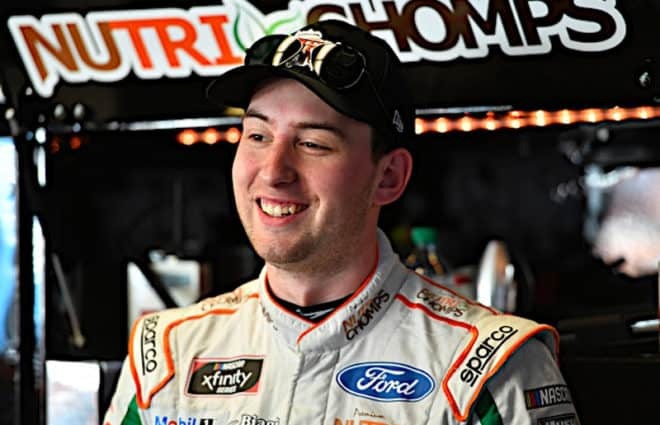 That’s to be expected from a first-year driver on an underfunded team, but Chastain told Frontstretch last week that those two drivers are lucky to have someone believe in them like team owner Johnny Davis does. “When I had starts to seasons that they’ve had, I got fired,” he said. Johnny has stuck with them and is going to let them learn and that’s huge. That’s huge for their confidence, them as racecar drivers and as people that somebody believes in them like Johnny does. I didn’t have that for so long, and that’s why I bounced around from team-to-team. Now through 11 races, Smithley sits 20th in points, while Miller is 26th. While the action was packed throughout the 300-mile race, Stage 3 was filled with carnage and rain, which depending on how you look at it, added to the race and definitely varied the pit strategy. There were nine cautions during the final stage, three of which were single-car spins; Vinnie Miller, Alex Labbe and Tyler Reddick. But as the checkered flag drew near and the rain closed in, intensity picked up and drivers started to make bold moves. On a restart with 39 laps to go, Kyle Busch made a daring three-wide move to the inside of Dylan Lupton for seventh position. However, the No. 18 car clipped the infield grass, shooting his Toyota up the track in front of the field. Luckily, it didn’t cause one of those massive melees, instead Chase Briscoe was the only other driver involved. Yes, this was a case in which Busch, a Cup Series regular, took out and damaged other XFINITY drivers and ruined their day, but it was a racing deal. 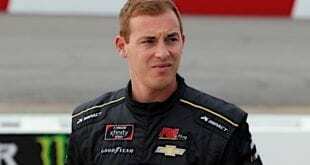 When Labbe spun with 54 laps to go, a handful of drivers pitted and made ground through the pack, led by Daniel Hemric, who got as high as third. Thus, he became the leader when Busch and Cole Custer came into the pits. The restart was filled with aggressive moves, mostly by Busch, but you come to expect that out of the No. 18 car. He’s one of the best drivers on restarts in all of NASCAR, so after leading 93 laps and sweeping the first two stages, you knew it was coming. Following the cleanup, the next restart didn’t go as planned either as Lupton spun on the backstretch, collecting Ty Majeski. Another racing deal, but restarts were frantic for some, while helping others. After a rain delay of more than an hour, the green flag flew with 24 laps to go. But another crash occurred with 20 laps to go coming out of the tri-oval when Justin Allgaier came up into the left front of Daniel Hemric, hooking the No. 7 car into Jamie McMurray. Yet, another racing incident. Two weeks ago, it was uncertain if Kaz Grala would be racing at Charlotte after being released from JGL Racing. 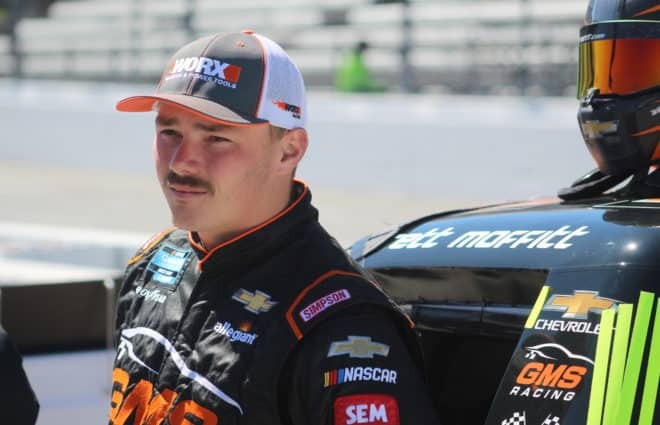 However, he was picked up by Fury Race Cars, who started an XFINITY program in less than two weeks notice, just for the rookie driver. Come qualifying, Grala wasn’t sure if he’d even be racing. The opening Cup Series practice was cancelled due to rain, and had XFINITY qualifying been postponed, the No. 61 car would miss the show. However, NASCAR got qualifying in and Grala had the 16th quickest time, which was tied for his second best qualifying run of the season. During the first stage Grala was getting comfortable with the racecar, finishing 16th, ahead of Lupton, who is competing for JGL Racing. In the second stage, he finished 13th, consistently moving up the scoring pylon, slowly but surely. When the green flag to start the final stage, Grala had to miss the chaos and mistakes other drivers made in front and around him. The No. 61 Ford reached eighth position before he started to fade late in the going, taking the checkered flag in 10th. Fury Race Cars will be competing in the next three races at Pocono, Michigan and Iowa before deciding what to do going forward. Grala earned a much-needed top-10 result, after having finishes of 20th or worse in the five races coming into Charlotte. 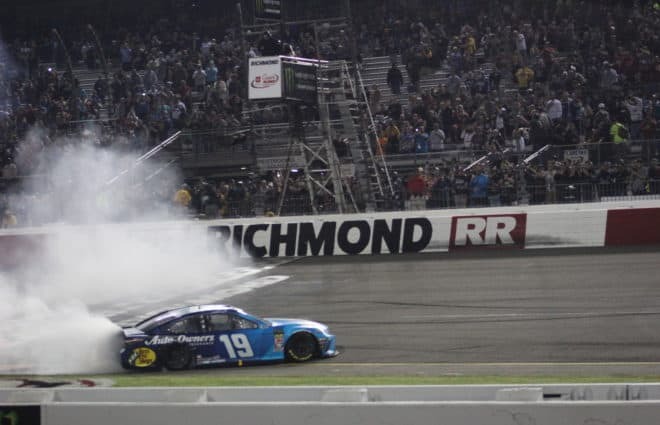 For the first time in five races, Cup Series regulars were allowed to compete in an XFINITY Series event, and they didn’t hold back. Combined, the five Cup drivers paced the field for 170 of 204 laps. Brad Keselowski was victorious, though Kyle Busch had the best car. Despite getting involved in a crash with 39 laps to go, the No. 18 car rebounded to finish eighth, his second top 10 in three races this season. Ty Dillon came from 20th on the restart that resumed the race from rain with 24 laps to go and jumped to fourth in the closing laps, recording his best finish of the season. Jamie McMurray and Chase Elliott had troubles, as the No. 42 car crashed, but Elliott, in his first race for GMS Racing, broke a transmission on lap 98. 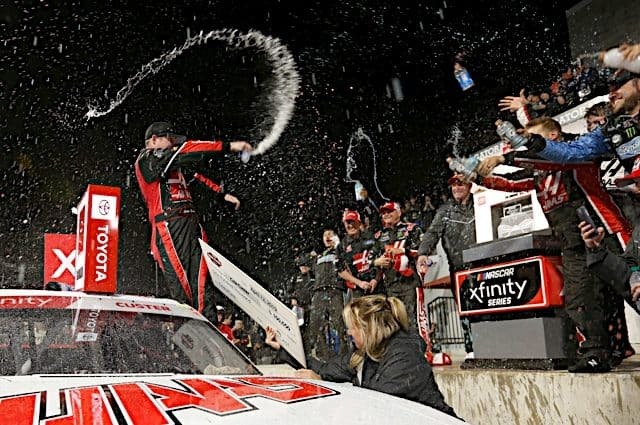 Over the past five races, the XFINITY Series has had some great racing. Saturday’s 300-mile event at Charlotte kept the streak alive. There was a lot of passing throughout the field and it led to drivers making mistakes. As Keselowski said in a recent NBC Sports podcast, the best racing comes when drivers make mistakes. The Alsco 300 was filled with mistakes and crashes, but the best part was the good, hard racing that the series has put on for much of the season. The XFINITY Series heads to Pocono Raceway next Saturday (June 2) for its third ever race at the Tricky Triangle. Brad Keselowski is the defending winner, though next weekend the series will be running restrictor plates, with the same package it used at Indianapolis Motor Speedway last season. William Byron held off Paul Menard for the win in that race, who will be piloting the No. 22 next week. Do you have any clue what “odds-on favorite” means, Dustin Albino? If betting is going to become part of NASCAR in the future, you and your peers really need to learn what the basic terms mean. For one thing, you state Brad would be “one of the odds-on favorites.” THAT IS MATHEMATICALLY IMPOSSIBLE! It would be extremely rare for there to be ONE odds-on favorite in a field of 30 or 40, but impossible for there to be more than one! You are saying in essence, that Brad and some other driver are BOTH more likely to win than not. Unless you are predicting a dead heat, that simply cannot happen. FYI, odds-on means that the odds of winning are better than even money. That is, an odds-on favorite is judged to be more likely to win than to not win. In horse racing with fields of 10-12, this occurs with some frequency. However, in auto racing, the strongest favorites are no better than 5-2. For example, one betting line lists Kevin Harvick at 5-2 today with Kyle Busch at 3-1, but Jimmie Johnson at 30-1. That means the bookies think Harvick and Busch have a pretty good chance, but the odds are still AGAINST them winning and the projected payout reflects that risk. Jimmie would be considered a longshot, which may make him an attractive bet based on the projected payout. Don’t use terms you don’t understand. The ignorance of auto racing writers is simply beyond belief. And it’s odds-on that they will keep making the same ignorant statements. Yes, this is a HUGE race weekend in Charlotte. Nascar keeps claiming that the Cup drivers running in the Xfinity series put more butts in the seats? It certainly didn’t appear to work that way yesterday. If they really want the Cup drivers in those races, they need to be limited to driving for non Cup affiliated teams. at least make them work for the wins, rather than out spending the regulars. You really took it easy on Busch’s bonehead move. So much for the “talent” level. Who did he blame? That free pass sure worked out for him or he would have finished around 24th. Much to the excitement of all 34 people in attendance. Now the 34 fans can go watch some real racing at the Dirt Track with the Outlaw Sprints for the second night. The good news as far as I’m concerned is that I didn’t waste my money and make it 35. Tuned is on TV and saw how many cup regulars and cup lite teams there were up front and remembered all the things I needed to do.